The sun never sets: a view of meteorite hunter’s campsite taken at 11pm. 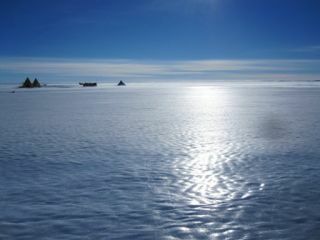 A team ofrock hounds is in chilly pursuit of meteorites, scouring their snowysurroundings as part of the 2010-11 field season of the Antarctic Search for Meteorites (ANSMET) program. In a recent blog post from Antarctica's LaPaz ice sheet, members of the search team reported thehunting is good. "We'vebeen campingon the ice here for two weeks and they have gone by fast," wroteMelissa Lane of the Planetary Science Institute, which is based in Tucson,Ariz. "In all, we found 170 meteorites here and the most interesting one, petrologically, seems to be the last one found!" Laneis a planetary geologist on the Reconnaissance Team, which also includes John Schutt, an ANSMET veteran of 30 years serving as thescience lead and safety officer, Serena Aunon,astronaut and physician from NASA's Johnson Space Center in Houston, andgeologist Stephen Ballou of Beloit College inWisconsin. "We'veall grown accustomed to the stark beauty here," Lane wrote. "Theflatness, the wind, the snow, and even (sort of) the cold are all special here.The team is going to miss this place, but we are excited for new scenery, too.We are moving our camp to the Patuxent Range that isover 100 miles to our NE. We'll describe it once we see it." The ReconTeam arrived at the LaPaz ice sheet Dec. 16,delivered along with its tents, sleeping gear and cooking stoves aboard a TwinOtter aircraft. Two other aircraft delivered snowmobiles the next day, allowingthe eager scientists to begin their first meteorite hunt. "Thebeauty of the area and sheer fun of navigating our snow machines over endlessfrozen ocean waves? wasa thrill for all," said Ballou. "Spiritsare high and we are all thrilled to be here, but every facet of our lives hereis work. It is challenging to do normal everyday things like dress, eat-- and just leaving the tent is often an act better suited for Houdini." TheReconnaissance Team is gearing up for 25 more days of camping in Antarctica,coupled with the change of scenery in the PatuxentRange, "where we can continue our new passions of meteoritehunters and huntresses extraordinaire," Ballou noted. NASA's Aunon described in a recent blog what the team faces. "Winds,winds...and more winds," Aunon wrote. "In Antarcticathe winds are relentless and forced the Recon Team to spend yesterday and thismorning inside the tent. "We didmanage to get out in the afternoon, however, and found an additional fourmeteorites in the field." Aunon said preparing to goout on the ice takes the better part of an hour. Team members put on multiplelayers of thermal clothing, apply sunscreen, gather equipment and warm up thesnowmobiles. "TheSki-Doos are our best friend out in the field as theycarry a survival kit for four people, meteorite gathering equipment, multipleliters of water, food, medical kits, iridium phones and GPS devices," Aunon said. "We take extra care in the morningsexamining the Ski-Doo engines to ensure peak performance." ANSMET fieldwork has been supported since 1976 by grants from the Office of Polar Programsof the National Science Foundation and NASA'sPlanetary Science Division. Meteoriteshave been found in Antarctica since the continent was first explored. The firstone was found in 1912, by a member of an expedition from Australia. So whathappens when a team member spots a meteorite? Thecollection process starts by using the meteorite hunter's toolkit, a relativelysimple collection of gear: sterile bags to contain the rocks, numbered tags tolabel them, tape to close and seal the bags, a notebook to take down anydistinguishing features of the sample, and scissors to cut the tape or the bagsopen. Great careis taken not to touch the meteorite or even breathe on it. Above all, adripping nose hovering over a specimen is a no-no! Themeteorite is placed in a sterile bag as quickly as possible, usually by puttingthe bag over it. The meteorite is measured and sometimes photographed, and itssize and color and possible classification are noted. A smallaluminum tag with an ID number is also inserted into the bag, and the wholething is then sealed up tight. At the endof a good day, a hunter's backpack can be full of these meteorite samples. Collectedmeteorites are shipped still frozen to the Antarctic Meteorite Curation labs at Johnson Space Center. There the samplesare carefully dried and cracked open, and small piecesare broken off for study as thin sections. With theteam ready to be transported to its new location, it was informed by briefersat South Pole Station Dec. 29 that weather over the PatuxentRange was not good and that the Twin Otters would be unable to fly out. "Couldit be true? A day off? As much as we would like tocontinue the search for meteorites, a day of rest was welcome," Aunon said. "We were able to catch up on phone callswith family and friends, write postcards, wash our hair (very refreshing but timeconsuming), write in our journals and enjoy a matinee showing of 'Nacho Libre' with the team." Now wellrested, the Recon Team is primed to continue its meteorite adventure at the Patuxent Range. "Inall, this will require four flights to transfer tents, food, Ski-Doos, fuel, and people. If we?re lucky we?ll have two TwinOtters at our disposal and get everything transferred in one day. We?ll keep you updated," Aunonsaid, signing off.